If you drive a Mercedes made before 2015, we can make car keys for your vehicle. We can make most keys in an hour or two, for much less than you’ll pay at the dealership – and without the hassle. Mobile or in-store service – whichever is more convenient for you. Mercedes keys have always been difficult to program, and that is still true today. Even though things have gotten easier in recent years, Mercedes cars are still more complicated to program than other types of cars. And for this reason, not every locksmith can program Mercedes keys. Specialized equipment and experience are required; otherwise, you risk doing damage to the vehicle. But making Mercedes keys is one of our specialties here at Northeastern Security, Safe & Lock. We can also quickly diagnose a problem – something that can be very difficult if you are not a specialist. For example, if your Mercedes key has lost its remote function, such as unlocking doors or opening the trunk, the key’s own internal battery may be dead or dying. However, if this is the case, your key should still be able to start the car. But if your key will not start the car, then the problem is more complicated. In any case, there is a good chance that we will be able to pinpoint the underlying issue and address it efficiently. It is worth pointing out that buying your Mercedes replacement key online is usually not the best option. First, it can be a very time-consuming process, since you have to wait for delivery (unless you pay a lot extra for expedited shipping). 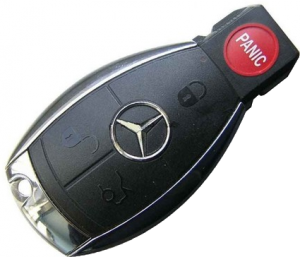 Second, unless you are an experienced professional, there is a high risk of buying the wrong Mercedes key, since there are so many options and confusing details. In addition to making new keys, another option to consider is making a copy of your existing key. Even if you are not having any problems with your key now, it might be a good idea to go ahead and get a duplicate. A duplicate key can be a real lifesaver! For instance, if you accidentally lock yourself out, you will have another car key to open the car, which means you won’t need to try to force the car open or call a locksmith. And of course, if you lose your key, you won’t have to pay someone to come out to you or to tow your car to a shop. We do more than just keys, too. We can code many different modules, such as transmissions, clusters, etc. And we can also fix a number of common problems. For example, a broken steering lock will make it impossible to drive your car. We can repair this as well, saving you hundreds compared to the dealership! If you decide to get a new key made, there are just a few things you will need to do to begin this process. The first thing we will ask you is for your vehicle’s chassis number. The easiest way to find it is to open the driver’s door and look for the tire information sticker. The chassis code will begin with the letter A, followed by three numbers (for example, a211). You’ll also need to bring your driver’s license, car registration, and insurance information in addition to a filled-out NASTF form (Authorization of Automotive Key Generation), which asks for your personal information as well as an odometer reading, purchase details, license plate number, etc. Once that is done, we can get started!